Coral Gables Movers – When you are moving it is helpful to have professionals who can guide you through the process. We serve the Florida area and have been helping people in and around the area, move for over 2 decades at unbeatable rates. Discount South Florida Movers guarantees that we will move your belongings in the safest and most expediently way possible. Every move has its special needs. We can assist you no matter what your moving needs are. From packing up the belongs to transporting them to their final destination, we can handle the entire business personally. We have teams that can move offices or residences. If you need a long distance move we will take care of it for you. Let our team of professionals take care of you. The City of Coral Gables is located southwest of Miami. It is probably most famous as being home t the University of Miami. It was a training and housing station for Naval soldiers during World War II. It started as a planned community during the land boom of the 1920s and has since grown into a city of 50,000 people. The city is notable for how well designed it was. The commercial district was designed so that all of the businesses were just a two block walk. As such it is known for how walkable it is. Points of interest in the city are the Fairchild Tropical Botanic Garden, the Coral Way, and historic Venetian Pool. Several businesses such as Bacardi and Del Monte are also headquartered there. 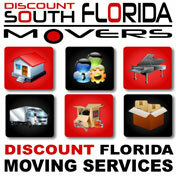 Discount South Florida and Coral Gables movers provide low rates on residential, commercial, piano and long distance moving.